Here are some pictures of various decorative woodturned items for your home. The items below are a mixture of bowls, hollow forms and platters. They are made from a variety of timbers: walnut, elm, oak, yew, robinia acacia, sycamore and other british timbers. All of the items seen are for sale. Just click on an item to find out the stock number then give me a call, or send me an e-mail. I am endeavouring to place photographs of various pieces on these pages, but not everything that I produce will be on display. You can always contact me for stock details. 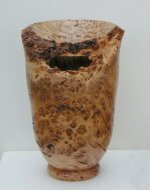 If you have an idea for a woodturned item that you would like to have made, why not take a look at the commission page. Carved text can also be added to your piece. A pair of collection bowls inscribed on the rim and underneath. If you would like more information on an item, just click on the picture.